I briefly mentioned in the past that we have done a Chipotle Club. I don’t know about you but I love Chipotle. I think I even see people doing @totalylmove quotes about Chipotle being a YL staple as much as Chacos and Nalgenes. Our club kids love it too. For our club students came dressed in foil, we had games basically involving eating burritos, or using a water balloon launcher to shoot burritos at people, you know…that kind of thing. 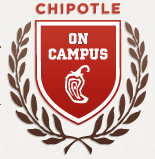 I don’t think I mentioned it because we have a local connection with Chipotle that has hooked us up with some free burritos and I didn’t want to gloat or rub it in (but I guess I said it so…oops). My friend at Chipotle just told me about a program that could be fun for a YL club kid to do. 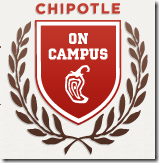 It is the Chipotle on Campus Student Brand Manager. I’ve seen this type of thing on college campuses, but not for high schools. If selected, the student will get $100 at Chipotle, some swag, and a Chipotle party for 20 of their friends (read as: you and your club kids). Now I should be up front and say that I don’t know anyone who has ever done this, in fact I think it is pretty new program. So I really can’t say it is good, bad, or neither, but if based on how great Chipotle has been as a company, I bet it could be fantastic. I could see a key club kid or junior leader contacting the local marketing rep and then having a Chipotle club to help spread the word. I think it could end up helping with fundraisers and attract kids to club who like Chipotle (I went to my first YL thing because of the food).